What is Auricular Therapy / Ear Acupuncture? Although Acupuncture has been around for as much as 5,000 years, Ear Acupuncture did not really take off until the 1950's when a French Physician Dr Paul Nogier noticed that some of his patients had healed scars from cauterization for Sciatica. 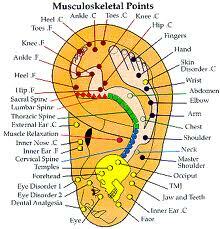 This was investigated further and his researches led him to develop a complete map of the ear. The report was published in the European Acupuncture Journal in the year of 1956. Some time after that Dr. Nogier's work came to the attention of Chinese researchers who enthusiastically pursued this new specialty. The range of conditions for which treatment protocols have been developed includes: addictive behaviors including smoking, acute and chronic pain, stress related and psychological disorders, skin circulatory respiratory and digestive disorders.My form of ear-acupuncture is non-invasive in nature. You will learn that peace is given to you when you accept the healing for yourself.